Jacks or Better 10 Play is a classic Jacks or Better video poker that can be played with 10 hands (ten lines of cards) simultaneously. You need to have at least a pair of Jacks or higher in order to win. Each line of 5 cards (hand) uses a different 52-card deck. Each line is treated as a separate hand for the determination of any wins. All 10 hands should be played at the same time so when you have chosen your bet size the game actually costs you 10 times the amount. The Jackpot hand is dealt first on line #1 and you choose which of the cards to hold. The cards you have chosen are held across the other 9 hands. The cards are dealt to the rest of the hands. Your winnings are collected on every hand that has a winning poker hand according to taytable below. 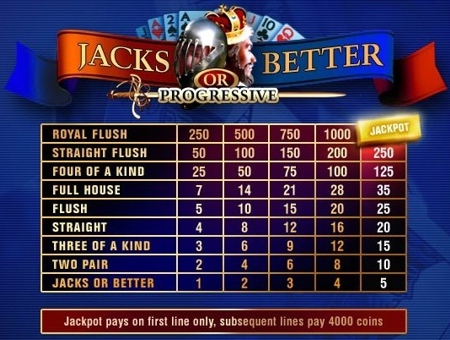 A small percentage of each bet, by every player on the Jacks or Better 10 line games in all Playtech online casinos, is added to a common pot. When you get Royal Flush on line 1 (Jackpot line) with the maximum bet you win 100% of the Jackpot. Only the Royal Flush on the Jackpot line wins you the jackpot, if you get a Royal Flush on any other hand you'll be paid 4,000 coins. After a Jackpot has been won, a new pot is started from the minimum value (seed) of $1,000.